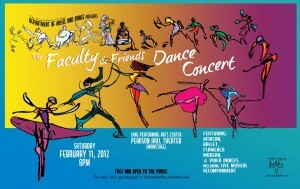 The annual Swarthmore College Department of Music & Dance presents the Faculty and Friends concert on Saturday, February 11, 2012 at 8PM in the LPAC, Pearson Hall Theater. This year’s concert features both new works and perspectives along with reconstructions of several older pieces. The performances will include a variety of styles including African, Ballet, Flamenco, and Modern along with showings of two dance videos. Several pieces will include live collaborations between dancers and musicians. One dance was commissioned in honor of Chuck Davis’s contributions to the field of African and African-American dance. Mr. Davis will be in attendance. The concert, which is appropriate for all ages, is free and open to the public. This entry was posted in Dance and tagged Faculty Dance Concert on January 30, 2012 by twebb1.